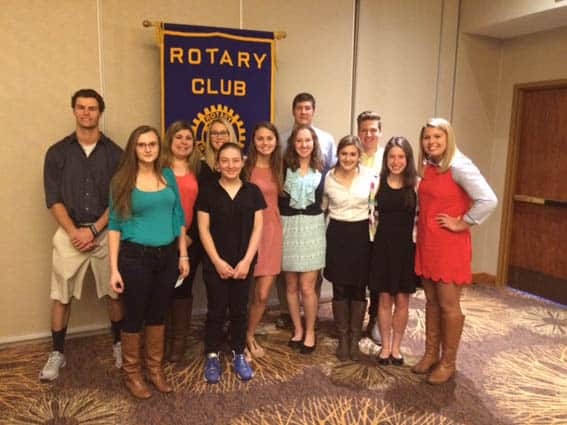 Rutland South Rotary Club awarded scholarships to 12 area students last week. Pictured from left to right: Jonah Farrow-MSJ, Mahala Stone-RHS, Courtney Currier-Proctor, Ali Fitzgerald-Stafford, Maddison French-Proctor, Jessica Audy-Mill River, Chelsea Young-Mill River, Claire DiIonno-MSJ, Logan Riesterer-Stafford, Noah Tanen-RHS, Megan Nadler-RHS, and Lydia Gulick. Twelve Rutland County high school seniors from Mill River, Mount Saint Joseph Academy, Proctor High School, Rutland High School and Stafford Technical Center were fêted at Rutland South Rotary Club’s annual scholarship breakfast last week. Rutland South Rotary Club has awarded these scholarships for close to 40 years. Much of the organization’s fundraising efforts goes towards this initiative as well as other youth-driven projects within Rutland County.